FrancigenaWays.com (CaminoWays.com sister brand) is offering a special treat for keen walkers to celebrate St Francis Day, the feast day in honour of Saint Francis of Assisi on 4th October. Book your walking holiday along the Cammino di Francesco before the end of October and get half-board accommodation for the price of B&B so you can enjoy the best Italian hospitality and cuisine. The Cammino di Francesco, also called Via Francigena di San Francesco or Saint Francis Way, follows a spiritual route inspired by St Francis of Assisi and has been walked by pilgrims to Rome over centuries. Divided in four sections, the Cammino di Francesco trail starts in the stunning city of Florence and crosses lush Umbria on its way to Rome and the Vatican. The Way of St Francis passes many important Franciscan sites such as the Santuario della Verna, the breath taking Sanctuary of Poggio Bustone and Assisi, as well as the Rieti Valley, also called the Sacred Valley, with its surrounding hills and mountains. Other stunning highlights of the Cammino di Francesco include spectacular natural wonders such as the Marmore Waterfalls and the gorgeous town of Gubbio. This trail of exceptional natural beauty is a fantastic walking trip, ideal for experienced walkers and hikers looking for a peaceful encounter with nature in one of Italy’s most beautiful regions. Sections 2 and 3 of the St Francis Way (from Sansepolcro to Rieti), two of the more stunning but challenging sections, cross the beautiful Apennines. They are perfect trails for keen hikers and walkers looking for an exceptional mountain trek in the heart of Italy. Contact the FrancigenaWays.com travel consultants for advice on the right Saint Francis Way route for your walking ability. Avail of this special offer and book your holiday in October 2013 to receive half-board accommodation for the price of B&B. This 7 day holiday from Rieti to Rome (Section 4 of the St Francis Way) starts from only €517pps (high season). Quote ‘St Francis Day special offer’ when booking. 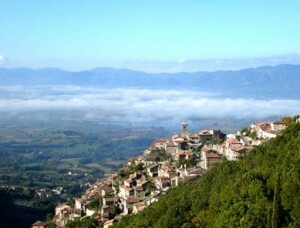 Find out more about this wonderful walking holiday in Italy. In addition to the special St. Francis Day offer, walkers can also get 10% off when booking a holiday now to travel in 2014. FrancigenaWays.com and CaminoWays.com returning clients also avail of 10% when booking a new walking holiday. Price includes: Accommodation (half-board for price of b&b if booked in October 2013), luggage transfers from hotel to hotel and a holiday pack. Price does not include: Flights, airport transfer or insurance. Contact our walking holiday travel consultants for advice.